What is with this guy and the schizophrenic rhythms? One measure is 4/4, then 3/4, then 5/4, then 7/4. Make up your freaking mind, composer. Jesus. I didn’t learn my pieces this week and it matters in a choir like mine. We sit and sing in quartets. I’m not singing in a sea of sopranos, I’m going to have either a tenor, bass or alto on either side of me. If you don’t know your part, not only will everyone know, you’re going to screw them up. I’m going to try to catch up as much as I can this afternoon. But I’m a slow learner. And Bernstein likes to mess with us. This season we’re doing his Missa Brevis (and lots of other pieces). 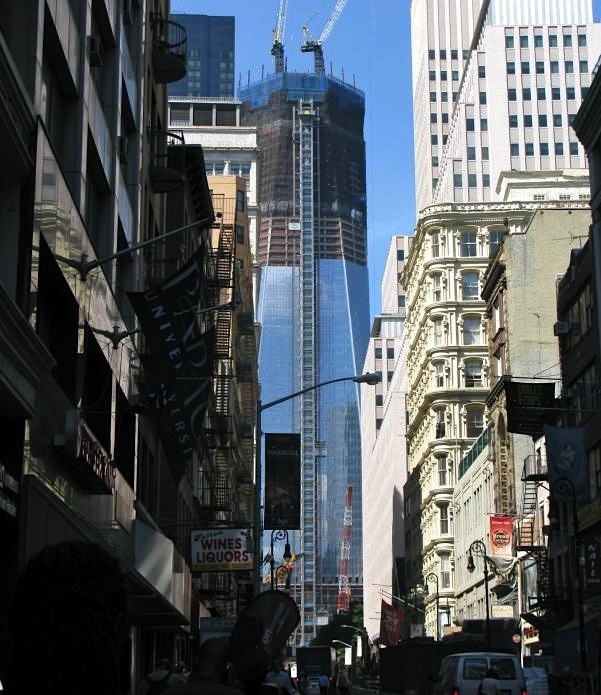 This is One World Trade Center shot from Fulton Street. God I can’t wait for it to be done. I can see it now from my building, I think I mentioned. I should do a shot now so I can have a nice before/after when it’s done.